What turns women to Lesbianism? Ideas from 1966. 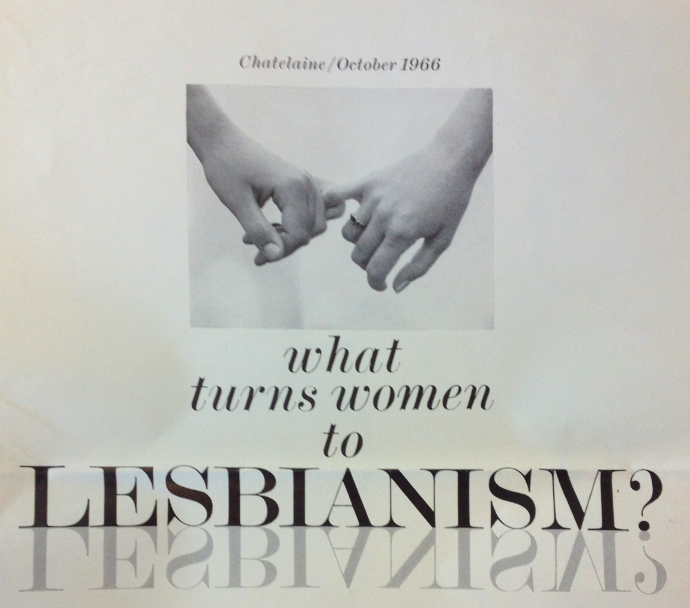 Chatelaine Magazine featured a 5-page article in October 1966, exploring the phenomenon of lesbianism written by Renate Wilson. Largely sympathetic, the author contrasted lived experiences of the lesbians she interviewed for the story with academic and psychiatric theories of lesbianism – a certain gulf existed between the two of them. Lesbians reported feeling fundamentally normal and were proud to be contributing members of society. Many did not know they were lesbian until their 20s: often after they had married men and had children. The article goes into some detail about potential causes of lesbianism, ruling out heredity, chromosomal abnormality, glandular imbalance, and free choice. Wilson settled on Freud and current (in 1966) psychological trends, which focus on psychosexual development and the role of parents in a child’s upbringing, which sounds far-fetched and bizarre to a modern-day reader. This entry was posted in Gay history, Uncategorized and tagged Chatelaine Magazine, gay, Gay history, history, human-rights, lesbian, queer. Bookmark the permalink.